The Wolfson Law Firm in Miami has represented motorcycle riders and their passengers since the 1960’s. Our Miami motorcycle accident lawyers have seen the defenses offered by insurance companies and insurance defense attorneys in negotiation and in jury trials. Motorcycle crashes often involve very serious injuries and in some tragic cases, wrongful death. But motorcycle accident cases involve bias and prejudice rarely seen in other negligence cases. The motorcycle accident lawyers in Miami at the Wolfson Law Firm are available right now to discuss your motorcycle accident. Just call us at (305) 285-1115 for your confidential and free consultation. Don’t be a silent victim. Get the answers you need and the justice you deserve. A car pulls out in front of a motorcycle. A crash happens. The motorcyclist runs right into the passenger door of the turning car. He flies over the handle bars and into the car. Then his momentum carries him across and over the vehicle. The motorcyclist extends his arms to protect his head and to break his fall. He finally hits the ground. He has extensive but common motorcycle accident injuries. So you think – the driver is responsible right? Not so fast. Insurance companies and insurance defense lawyers count on the inherent bias and prejudice of the general public against motorcycle riders to drive the value of every Miami motorcycle accident injury case. Miami motorcycle accident injury lawyers know how this works. When two cars crash, fault is usually assigned based on the facts. However if a motorcycle is involved, the motorcyclist seems to have a higher burden of proof because of perception, prejudice and bias against motorcycle drivers and riders. The Miami motorcycle injury and wrongful death lawyers at the Wolfson Law Firm compiled a list of the usual defenses used by insurance companies and their lawyers in negotiations and jury trials. Our Miami personal injury lawyers hear these defenses from the first call to the insurance company. These motorcycle defenses continue through litigation and trial. The reason that our Miami lawsuit and litigation lawyers hear these same defenses is because they work for the insurance companies most of the time. It is important for your Miami motorcycle accident injury lawyer to be aware of these defenses and be ready to counter these arguments. 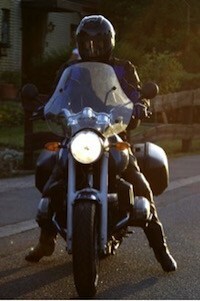 Before hiring any motorcycle injury lawyer in Miami or anywhere, make sure you discuss these defenses with the lawyer. You will want to know how the Miami personal injury attorney will handle these defenses before you retain him or her as your lawyer. Operator – The first focus of a defense is the motorcycle driver. How much experience does this driver have? How much experience did this motorcyclist have on this particular motorcycle? Was the motorcyclist healthy? Any disabilities? Sight? Hearing? What type of clothes was the motorcyclist wearing? Were the clothes bright enough? Were they wearing any protective gear? The insurance company will often inspect every inch of the motorcycle looking for any added equipment for comfort or performance. if the motorcycle has loud muffler pipes then the insurance defense lawyer will likely say that the motorcyclist was at fault because of the loud pipes and they could not hear a horn or some other thing that they will argue would have prevented the accident. Where were the mirrors positioned correctly? What could the motorcycle driver have done to avoid this accident? If all else fails, the insurance defense attorney will argue to the jury that sometimes accidents happen and that doesn’t mean anyone is responsible. Plus, the motorcyclist knew these risks the first time they got on a motorcycle in Miami. If you lost someone in a fatal motorcycle accident, the Miami motorcycle wrongful death attorneys at the Wolfson Law Firm can help. If you or a loved one were hurt in a motorcycle crash, our Miami motorcycle accident injury lawyers are here to assist you. We welcome the opportunity to meet with you. We will share our recent results andqualifications. Our Miami personal injury lawyers are available to answer your questions. All you need to do is contact us at (305) 285-1115 for your free consultation. The Miami personal injury lawyers at the Wolfson Law Firm proudly serve the neighborhoods and communities of South Florida including but not limited to Coconut Grove, Cocoplum, South Miami, Miracle Mile, Olympia Heights, Sunset, Coral Terrace, West Miami, Virginia Key, Fisher Island, South Beach, Edgewater, Riverside, Lemon City, Miami, Brownsville and Miami Shores.